So here is the next instalment catching up on our activities and whereabouts over the last two weeks. After ending up unplanned in Lindau, Germany, after a long drive from Holland, our initial plans were to head East and into the German and Austrian Alps (we'd even bought our Austrian vignette!). However, my stomach problems reoccurring forced us to reconsider our options. Following a few days resting up around the Bodensee considering many possibilities, we made a bold decision, with me not feeling well, to change course and head West, driving back to France in search of better weather in more familiar surroundings. Such long drives and extra miles to change plans wasn't something we were used to and something we'd actively tried to avoid on our travels last year so it did take us the few days resting in Tettnang to realise it was what we needed at this time. Towards the end of last year we realised our travels was far more than a physical journey and the places we were fortunate to visit; we were on a journey back to health and happiness. So however tempting exploring new parts of the Alps was, this was our priority. The maps showed that the quickest and easiest way to get quickly to France would be to drive the length of Switzerland on the motorways and we crossed the border at Geneve and ended up at Lake Annecy. Sadly although we woke up on the shoreline of the very beautiful Bodensee, close to the centre of Lindau, I woke up with stomach problems, mainly that of bloating and excessive gaseous output (great!). It was so bad, that I felt the need to apologise to our new motorhome neighbours, Mike and Lynn, an understanding British couple, as the motorhome parking spaces meant we were living very close together! We took a short bike ride in search of organic vegetables to juice, into the centre of Lindau along a very pretty and busy lakeside cyclepath. (It is now possible to follow the cycle path 273km around the whole of the Bodensee, which many happy cyclist tourists were attempting, making us reminisce of our own previous cycle tours. Cycling also onto the Island for our shopping had in hindsight been a bit too much for me so we sat by the lakeside whilst I tried to get the energy to get back to the motorhome. Sadly I wasn't in the mood for many photos that day but it was a wonderful area which looked just stunning in the sunshine (so we will come back and explore Lindau properly in the future!). The rest of the day was spent resting up in the motorhome and as I started to feel a bit better in the late evening, we had a lovely few hours getting to know our neighbours Mike and Lynn. It was our first time speaking to other motorhomers again since we had set off again and we enjoyed swapping stories and eagerly wrote down some tips and recommendations. The next morning we woke to rain in Lindau and a distinctive chill in the air. We drove a few kilometers to the nearby town of Tettnang where there was another motorhome Stellplatz as well as some farm shops. The next two chilly days offered a mixture of rain and some sunny spells. The periods of rain were spent considering our many next options and consulting the maps and camping books (and for Dan the sunny periods allowed him to go for a few runs to let off some steam). With much rest, some simple foods and organic vegetable juices, I felt well enough to go out to explore Tettnang and enjoyed a short look round the new castle and pretty the town centre. Living in a motorhome in the rain is decidedly harder than when the weather is fine. Which under normal circumstances wouldn't be an issue for us but with me not feeling so well and feeling like I might have left the comfort of Holland too soon, we decided to get back to some more familiar territory. However much we wanted it to be, now wasn't the time to go exploring the German and Austrian Alps. 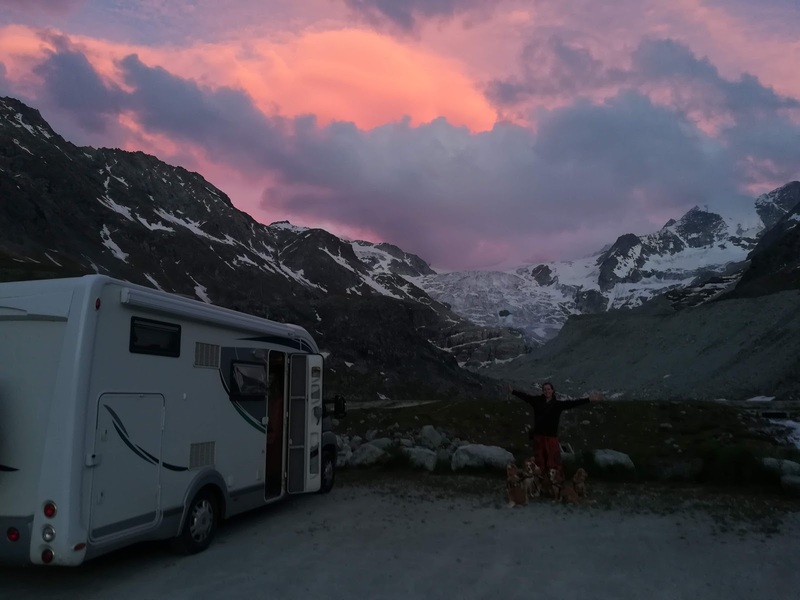 Deciding that the long range weather forecast looked much better in France and particularly the Rhone Alps, we knew it would be easier on the French motorhome aires and there were still some campsites offering the ACSI discount. So after restocking our vegetable supplies and more rest on the Saturday, we took the opportunity to hit the roads on Sunday. The maps showed the quickest and easiest drive was to buy a Swiss motorway vignette and drive across the whole country and cross into France at Geneve. So although it was only a short visit to the Bodensee, it has been marked on the map as a place we want to try and get back to.... if we're lucky on this trip as we'd still love to get to explore Austria (especially as we have bought the road vignette which hasn't been used yet!). So we left Germany, crossed briefly into Austria before entering Switzerland, the first time since last October, where we were greeted by two smiling border guards (I think they could see I was taking a photo of them - it was the only guarded border we'd experienced in the past few days even though we'd passed through 5 countries). Feeling good as the roads were relatively quiet and easy to drive as well as taking regular stops (we even found a motorway service stop outside Lausanne which offered a 'Euro Relais' motorhome point so took the opportunity to plug in! ), I even felt well enough to do some of the driving and so we ended up driving through the whole of Switzerland that day. From Geneve we found ourselves arriving at the motorhome aire at Annecy in the warm evening air with the light just fading. So in that one day we had said 'see you later' to the Bodensee, been reunited with Switzerland, and been welcomed back to France by Lake Annecy. It had been quite alien to us to drive such a big distance, not just on that day but over the last few days since Holland. Driving to change our plans so drastically, particularly in one day, wasn't something we did or even really contemplated last year. We were tired but also feeling better. Although we had said before setting off that this year we were going to try and resist the pull of places we had been before, pushing our comfort zone and exploring only new areas, when you aren't feeling well, it was a great comforted to be back somewhere familiar and which had happy memories attached to it.